There is really is something strange and mysterious about the harsh rocky outcrops, called the Stiperstones, that loom over the Shropshire villages of Snailbeach, Ratlinghope and The Bog. These photographs of the “stones” were taken on a bright (if cool) summer’s day and, even then, they exuded an aura of majesty and menace. To visit them in mid-winter in sub zero temperatures with mists and fogs swirling over the cliffs would be a daunting experience. They are at the centre of many dark legends that range from being the burial place of a wild prince of England to being the earthly throne of a devil. The earliest tale relating to the mysterious Stiperstones is Arthurian in origin and ties in with the likelihood that the legend of this mythical British King originated in the remarkable, and often forgotten, county of Shropshire in England. The story goes that two great dragons, one red and one white fought a terrible battle over the lonely forests and bogs of south Shropshire and were seen in a dream by the great enchanter Merlin. Finally, locked in the embrace of death, they fell to earth and became the mountain ridges of the Stiperstones and the Long Mynd. From the air there is definitely an uncanny resemblance to these beasts in the way that the two ridges lie adjacent to each other. 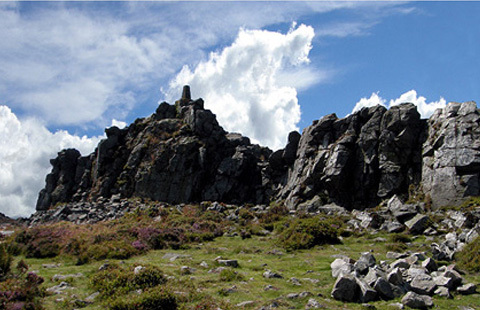 While the tale of dying dragons is no more than folklore, the strange and incredibly old peaks of the Stiperstones are renowned for strange happenings and dark legends. According to geologists the Stiperstones ridge was formed 480 million years ago which makes these mysterious rocky outcrops some of the oldest visible stones in the world. Formed of quartzite, their peaks have slowly shattered through the process of freezing and thawing until they assumed their distinctive and brooding formations. There are six distinctive rocky outcrops each with its’ own name. 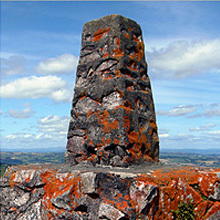 From north to south they are Shepherd’s Rock, Devil’s Chair, Manstone Rock, Cranberry Rock, Nipstone Rock and The Rock. The most famous of these “Stiperstones” outcrops is the Devil’s Chair. As with most folklore, the story has many variations but this is the version we preferred. The story goes that that there was once a great collection of towns to the North-East of the Stiperstones that stretched for miles from Castle Pulverbatch to Wroxeter, just south of Shrewsbury. However, a time came when the nobles* that lived in this “great place” disappeared leaving only their palaces and memories. A curse fell on the land and war swept over the place leaving only ruins and decay. Years passed without ever seeing a warm summer and the lands were flooded becoming marshes and untamed woods. One day, the Devil was walking across (Salop) Shropshire and happened upon these wild and desolate lands where many, but not all, still worshiped the “old” gods. He chose to build himself a mighty castle high on the peaks of the hills from where the bitter cold was a respite from the fires of Hell. Fearful of damaging his talons he employed the services of six female giants from Wales to bring to him the stones for his castle in their aprons. However, a young lord by the name of Shrobe, (Shrobbe: Born of the Forest / Heath) saw the approaching giantesses and correctly surmised that they were “set on works of evil”. The first, the one carrying the cornerstone, was tripped with a rope and she dropped the “The Rock” and departed in shame. The second he lured into a stream and the third he drugged with sweet berries that grew wild on the hills. One-by-one the Giantesses were tricked into abandoning their loads. When the Devil came to see his new castle he found only six great piles of rock. A great anger descended upon him and tears of molten lead fell from his eyes to burn their way into the ground. How to Find London Bridge: London Bridge refers to many historical bridges that have spanned the River Thames between the City of London and Southwark, in central London. The current bridge was opened in 1973 and is a box-girder structure built from concrete and steel. This replaced a 19th-century stone-arched bridge, which in turn superseded a 600-year-old medieval structure. A series of earlier bridges were built an replaced over the centuries dating back to when the Romans established London around 2000 years ago. The current bridge stands at the western end of the Pool of London but is located some 30 metres (98 ft) upstream from the earlier constructions. Enraged, the Devil scooped together a pile of rock to form a chair and waited to see if he could discover the culprit of his misfortune. 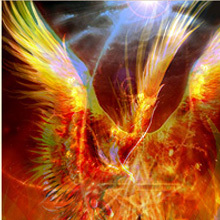 He had not been so angry since the time that he had be cast out of Heaven by the Angel Michael. With spit and blood on his chin he swore to wait and watch the place for all eternity, if necessary, until the miscreant was caught. Years passed until one day Lord Shrobe decided to visit again the place where he had defeated the giantesses. As he neared the place a young and beautiful maiden of the Faerie Realm who was taken by Shrobe’s handsome face ran in front of his horse. She warned him that the Devil was waiting for him. Shrobe thanked the maiden for her advice but assured her that he intended to go on. In desperation the maiden offered herself to the young prince but in exchange he must give up his journey. Shrobe, taken by the beauty and passion of the Faerie princess agreed. Together Shrobe and the fairy princess (Mgwathean Rigantonia*) had seven sons. Three of their sons were handsome, magical and wise. Three of their sons where ugly, deformed and cruel. Each of those that were tainted was killed by the princess on their seventh birthday. The seventh son was Eric, the true son of Shrobe, and it was he who later became a great Prince of England. Sadly, Shrobe aged but Mgwathean did not for to her kind the years of men last no longer than “Snowflakes in Summer”. When Shrobe was near death Mgwathean took him back to the Stiperstones and opened a portal in the rocks which would take her to her home. 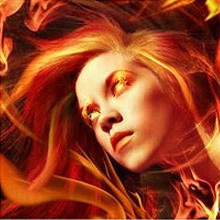 As they entered, and at the last moment, the Devil, still waiting in his chair, saw them and threw a bolt of fire. Rocks splintered and the ground slid to cover the doorway to Mgwathean’s world. But … it was too late for The Demon Master. On entering the Faerie realm Shrobe became as one of “Blessed Realm” and his youth and beauty returned although he could never again visit the world of mortal men. The Devil, beside himself with rage, cast fire in all directions burning bare the hills around him so that only heath and heather could ever grow there. Finally, he departed back to Hell but with the promise that he would return once a year to see if the door to the Faerie realm had revealed itself so that he could pursue Shrobe and exact his vengeance. It is true that even to this time there are several days in every year that a strange mist descends over the Stiperstones and even the most determined hill-walkers stay away. During these periods more than one sensible and rationale person has described a fog that pulls at your clothes and the overwhelming smell of sulphur. 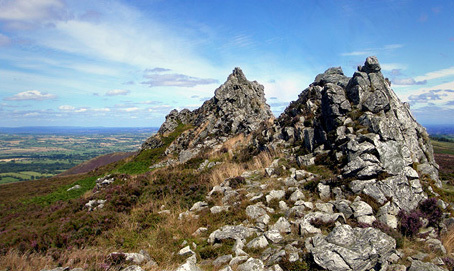 Obviously, the story of Shrobe and Mgwathean is a legend, the meaning of which we that we may never fully understand, but there is no doubt that something strange and dark persists in the rocky outcrops of the Shropshire Stiperstones. As mentioned before, there are several variations of this tale. In one the Devil is on his way to “Hell’s Gutter” to fill it with rock and drops the stones that he was carrying. In another the Devil slashes the apron strings of a Giantess who was carrying rocks to build either a castle or a garden – and the rocks tumble to the ground to form the hills. In one variation of the tale, the Devil is infuriated to see that the prosperous and happy inhabitants of the area have tamed the land and planted fertile fields. Determined to upset these happy folk he scatters ten million rocks on their lands to stop them farming any more. Why the Devil should have a particular grudge against these folk of Shropshire has never been explained.One part of the legend claims that if a human should sit in the “Chair” an unnatural thunderstorm will lash rain on the surrounding lands. Whatever really happened in this region it has left a mythical “Devil” memory that has persisted for more than a thousand years. Not only are there “Devil” tales but also references to a wild demon dog (The Devil’s Hound) with fiery eyes that is sometimes seen on the road near Snailbeach and a ghostly carriage near Ratlinghope has been reported – according to internet accounts – quite often. One legend claims that a Saxon prince, Wild Eric, who defied the Normans in the 11th century rides with a ghostly army in the skies over the Stiperstones whenever Britain is threatened by war. Sightings occurred before the Napoleonic Wars, Boer War, Crimean War, the First World War, the Falklands war and the First Iraq war. Finally, according to myth and legend – all the un-dead and Ghosts of England are said to be summoned to the Stiperstones at the mid-winter solstice to pay homage to the King of the Damned. Is this true?